Through the recognition system chip - in spindle SiS and incorrect tool positions can be detected immediately by trapped chips. This quality control which runs before the beginning of the manufacturing process, thus prevents faulty parts caused by chips in the planar system. Extensive post-measurements such as, for example, in the case of laterally determined run-out errors are omitted, since these are detected by the SiS of. The system is integrated into correspondingly modified motor spindles, also withstands hardest operating conditions and is completely maintenance-free. The detection for chip-in- spindle SiS is also able very small impurities, such as chips in the micrometer range between tool and motos spindle,and with a delay of few milliseconds to the machine control. This is particularly the case in applications which are characterized by frequent, fully automatic tool changing marked are, circular error is prevented. The system can be used with spindle speeds from up to 18.000 U/min apply. 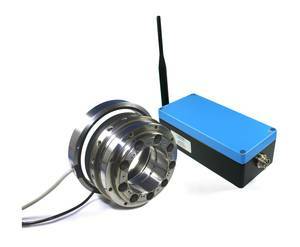 The power supply ensued inductive and the data transfer from the rotor of the spindle wireless.